Call your Senator today, and tell them: No cuts to Social Security! The Co-Chairs of the National Fiscal Commission have proposed deep cuts to Social Security – increasing the retirement age to 69, cutting benefits for middle-class workers and reducing annual cost of living adjustments. We need your help to stop them! 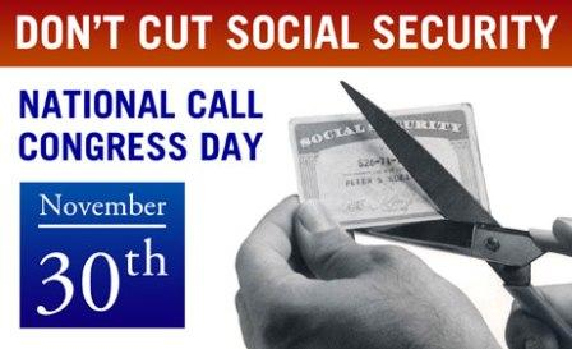 Join today’s National Call Congress Day at 1-866-529-7630 and tell Senators Maria Cantwell and Patty Murray to say “No” to cutting Social Security. Social Security is a promise that must not be broken – Americans have worked hard for it and paid taxes for it. Social Security belongs to our children, our parents, our neighbors and ourselves. And it hasn’t contributed one penny to our nation’s deficit. ACT NOW! Your voice needs to be heard. Call your Senators right now at 1-866-529-7630. After providing your zip code you’ll be given a choice of which of senator to be connected with. Call both if you have the time. It only takes a minute each. Please take the time for this very important effort today. This is for you, your children and your grandchildren. Don’t let politicians in Washington cut our Social Security. Act today!